The Lord’s Cross in the life of saints and sinners. And today we see before us an extraordinary example of the victory of the Cross over the demons. Today we commemorate the wondrous saints, the three young martyrs Faith, Hope and Charity, and their mother Sophia, - who deeply wounded the demons. 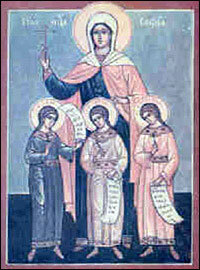 These holy martyrs are truly amazing: three young girls (the oldest – Faith – was 14, while the youngest – Charity – was only 9 year old), and yet these delicate and fragile maidens courageously endure the cruelest torture for the sake of Christ and put to shame the Roman Emperor himself; while their mother, suffering cruel inner torment and anguish, against her own maternal nature encourages and inspires her beloved daughters to endure martyrdom. These holy martyrs, however, not only represent a wondrous example of drawing strength from the Cross, but also have a deep symbolic meaning in the Christian Church. The maidens bear the names of the three greatest Christian virtues – faith, hope and charity – and are born of their mother Sophia, whose name means “wisdom.” Therein lies the depth of meaning: it is precisely spiritual wisdom which gives birth to these virtues in us, nurtures them in us and helps us bear spiritual fruit from them. And the way all of this actually takes place in life can be seen in today’s Gospel reading. Dear brethren! Let us exhibit these three virtues – faith, hope and love – towards God, towards our Lord Jesus Christ, and towards our neighbors; let us follow the wondrous example of the holy martyrs Faith, Hope, Charity and Sophia, who did not hesitate to give up for God’s sake all their earthly gifts – youth, health, wealth, family affection; let us appreciate with all our heart Christ’s sacrifice on the Cross, which was made for our own salvation; and let us build our lives upon the Cross of Christ, so that through us, too, the angels would be glorified and the demons defeated. Amen.